For centuries, adults and children have enjoyed spending time together reading or visiting the library. Now, with the abundance of children's literature sites on the Web, they also can take pleasure in those experiences virtually. Children's literature sites offer exciting interactive versions of stories that are sure to engage children's interest and inspire in them a love of literature. Teachers looking for good books to share with students and parents interested in helping their children learn to love books at will find all the help they need at these sites. This site showcases the seven-book series The Chronicles of Narnia, by of C.S. Lewis. A discussion of each book, along with an online chapter, is provided. Interactive maps and audio files give visitors the opportunity to travel the world of Narnia where the Narnians are introduced through illustrations, character sketches, and an interactive game called "Who Am I?" StoryPlace, presented in both English and Spanish, offers children the opportunity to view online stories, participate in interactive activities, and print activity pages. 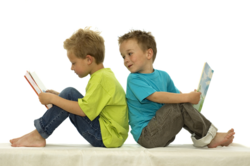 Two libraries -- pre-school and elementary -- categorize stories into age-appropriate themes. New stories and activities are added each month. Included is a link to the Book Hive, a guide to children's literature and books. KidsReads focuses on literature for early and middle elementary students. The site, which includes everything from classics to brand-new releases and series, offers reviews of current children's books, excerpts and author interviews, as well as fun interactive activities for children. Students and teachers can sign up for the weekly e-mail newsletter. Web-Pop Books offers a variety of online and printable books for elementary students. The interactive stories, which teach basic human values, are sure to engage your young students for hours. Students can read the stories alone or follow along as the author narrates, and the site includes a download section that allows visitors to download and print the stories for their own personal library.